This is the CD artwork Pen and Ink enthusiasts have been waiting for. Created exclusively for SCM, you will find 27 of the most intricate, detailed drawings imaginable. White Tail Deer, Mule Deer scenes, Wolves, Geese, Ducks, Moose, Elk, Eagles and many more images abound on this one of a kind CD. These beautiful designs were developed to meet all of our customers� needs, from sandblasting to engraving, woodcarving, scrimshaw detailing, these are the images you requested! 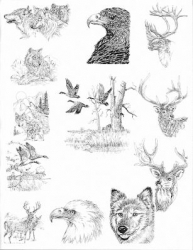 This artwork package has designs in .TIFF � JPG file format. A program will be needed to enable the opening of these file extensions.